As miners exhausted the hushes they dug into the hill sides producing Levels (horizontal tunnels) to gain access to the lead veins deeper in the hillside. 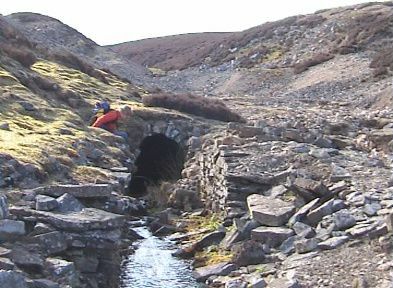 Level entrances are still prominent in many valleys, appearing as arched tunnels – often lined with dressed stone. Sometimes natural caves were used as an access point to lead veins and then Levels dug within the caves to gain deeper access to the ore – examples of such caves are at Devis Hole Mine near Grinton Smelt Mill in Swaledale and Dow Cave, near Kettlewell in Wharfedale. Within the Levels miners usually dug upwards into the lead veins. This meant that gravity helped to bring the lead ore down to the level below where it could be taken to the surface. To achieve this, wooden platforms called Stopes were built ever higher into the worked out veins and accessed via wooden ladders. Ultimately miners could be working at great heights on these platforms. Waste rock and other materials called Deads had to be removed from the area but to many miners this was a waste of effort and so large quantities were left on the Stopes, a real danger to people exploring the mines today as the wooden platforms become rotten. Water was an ever present danger in the Levels and shafts. Heavy rain could turn Levels into underground rivers very quickly. Most Levels were dug slightly uphill to allow water to drain away, but the working conditions were always wet and potentially dangerous. Levels often had metal track-ways laid for the use of wagons to carry Spoil (waste products) and ore to the surface. These were often pushed by the miners, but in some mines ponies were used to haul the wagons. The uphill nature of levels helped with the removal of heavy wagons. Spoil was usually deposited at or near the mine entrance and picked over by children for ore that can be salvaged. Most mining areas are still covered by large Spoil heaps which remain barren to plant growth because of the concentrations of lead. Wagons of ore would be pushed from the level to 'bouseteams', stone containers where ore was stored before being taken for processing.